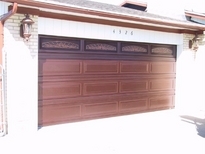 Martin’s Cyprus model draws on the beauty of pure copper in traditional garage door designs. 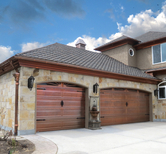 This enduring metal is a perfect accent for many beautiful, one-of-a-kind homes. It is available in long panel, short panel, grooved panel, flush panel, and ribbed design. All designer window options are available. White powder coated track and section hardware is standard.